Here is a small clever thing. 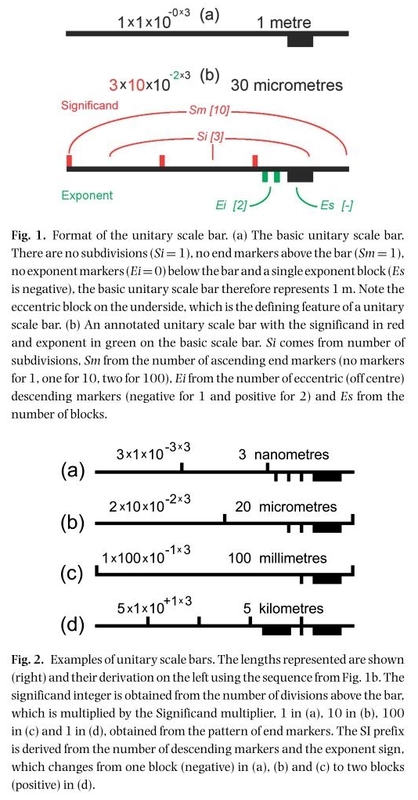 A paper by J. Adler (2008) called "The unitary scale bar: human and machine readable" which appeared in Journal of Microscopy, 230 No 1. 163-166. A format is described for a scale bar that encodes the length represented within the structure of the bar itself, thereby removing the need for any supporting text. Although the 'unitary' scale bar has a conventional appearance it is also machine readable and therefore retains information about the scale even when the file format is changed. The format is based on the metre and is suitable for all terrestrial applications.